UNITED NATIONS, November 21 -- The International Criminal Court's first trial, of Congolese militia leader Thomas Lubanga Dyilo for conscripting child-soldiers, will begin next March 31, possibly in Eastern Congo. Wednesday at the UN, Inner City Press asked Fatou Bensouda, the ICC's Deputy Prosecutor, a series of questions about the Lubanga case, including complaints by human rights groups that Lubanga was not also indicted for murder and systematic use of sexual violence by his Union des Patriotes Congolais ("Union of Congolese Patriots"). Ms. Bensouda offered two justifications: that Lubanga had been on the verge of being released, and had to be indicted on the charge for which there was the most evidence, and that the issue of child-soldiers is best raised by having the charge stand alone in the Lubanga case. In the ICC's second Congo case, Germain Katanga, of the Patriotic Resistance Force of Ituri, FRPI, is charged with murder and sexual enslavement as well as the use of child soldiers, in connection with the destruction of the village of Bogoro. Still, it is well known that Katanga, like other Eastern Congo warlords, was supported and even directed from outside, whether from Kinshasa, Kampala or Kigali. Ms. Bensouda. added that the ICC is working toward a third Congo indictment. Video here, from Minute 43:09. Inner City Press asked, again, why notorious child-soldier recruiter and UN peacekeeper hostage-taker Peter Karim is left freely walking around the Grand Hotel in Kinshasa, having leapt from the Front of the Integrationist Nationalists, FNI, to become a colonel in the Congolese Army. We cannot just indict someone, Ms. Bensouda replied. We need to develop our own evidence. Video here, from Minute 51:52 (the UN's write-up of the press conference did not include any mention of Mr. Karim or this question). But UNICEF itself counted the dozens of child-soldiers Karim has recruited. The same is true of Matthieu Ngudjolo of the Congolese Revolutionary Movement, MRC. 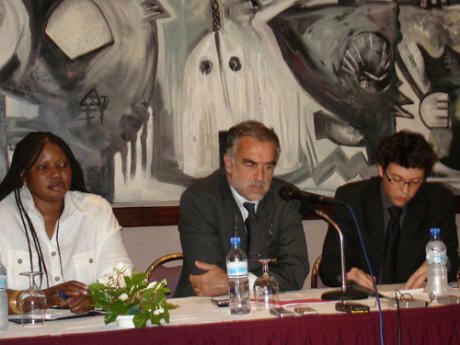 In terms of logistics, Ms. Bensouda said that France had sent a plane to transport Lubanga from the DRC to The Hague. Neither France nor any other member state helped with the transfer of Germain Katanga. In terms of specifics, she acknowledged that the Office of the Prosecutor has made a filing with the pre-trial chamber that the LRA's Vincent Otti may be dead. She spoke strongly for the primacy of international criminal law over those who now push for the ICC to back down or not to get engaged. After Ms. Bensouda press conference, Inner City Press spoke with the UN's special representative on children and armed conflict, Radhika Coomaraswamy, who was scheduled to meet with Ms. Bensouda later in the day. Ms. Coomaraswamy said the ICC is preparing a third prosecution in the Congo that might address Inner City Press' concerns. We'll see. Click here to view Inner City Press' 2006 stories on Karim and Kony and the "Warlord in the Waldorf"